June 26th, 2015 – A few weeks ago my 7 year-old son learned the “n-word” from a troubled child in the school aftercare program. My wife and I had a talk with him. We explained some of the history behind the word and its meaning, and told him never to say it. 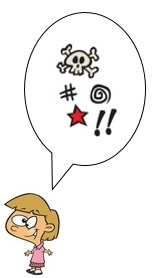 Unfortunately, children aren’t always good at remembering parental warnings, so a couple of days ago my son repeated the word to a classmate who wanted to talk about “bad words”. A teacher overheard, and called my wife to let her know what he had said. That evening, we made it clear that he would have to face consequences (early bedtime and no video games for a week) for thoughtless disobedience. But…are there really any “bad” words? After all, words are just collections of letters that make sounds – a meaning vehicle. Calling the word “bad” suggests that there is some inherent power in the word itself. But this is demonstrably false. Try out some “bad” or “swear” words on someone who doesn’t speak English, and you won’t get much of a reaction because the meaning hasn’t been conveyed. Of course, most people realize this, but terms such as “bad words” still send a false message that words have power. 88:6.7 (972.7) Gradually science is removing the gambling element from life. But if modern methods of education should fail, there would be an almost immediate reversion to the primitive beliefs in magic. These superstitions still linger in the minds of many so-called civilized people. Language contains many fossils which testify that the race has long been steeped in magical superstition, such words as spellbound, ill-starred, possessions, inspiration, spirit away, ingenuity, entrancing, thunderstruck, and astonished. And intelligent human beings still believe in good luck, the evil eye, and astrology. 90:5.3 (992.4) Words become a part of ritual, such as the use of terms like amen and selah. The habit of swearing, profanity, represents a prostitution of former ritualistic repetition of holy names. In more (okay, only slightly more) thoughtful times such as these, our use of language needs to evolve beyond olden magical thinking and ritualism. Positive or negative responses to words are entirely dependent on the attitude and the cultural/experiential context of the listener. The maturity of the listener also determines their ability to exercise self control over their response. By teaching that words have power, we transfer some response-responsibility from the listener to the speaker. This leads to a dramatic increase in “offended” people who demand restitution from speakers of “bad words”. Our material/animal “self” naturally tends to try and find offense with others’ words because it can lead to a guilt-induced power over them. The “offended” person can demand restitution, regardless of the intent of the “offender”. What have your experiences been with “bad words”? How did you handle it when your child uttered one? This entry was posted in Blog Posts and tagged bad words, Children, Urantia. Bookmark the permalink.